I have been coveting a lot of pretty things lately, and I think that this will be a regular post, on the jewelry and accessories I love, and want. I absolutely love jewelry, even though I almost always forget to wear them, and haven't bought any new jewelry in forever. As I was browsing rings, I've noticed that animals are starting to become a main trend in jewelry. And some of them I like a lot, especially the snakes! Raw stones have also lately become an ever growing trend. I think I have an affinity with jewelry because I love to make jewelry, and I really really wish I had a metal-smithing studio. This is a great post! I want many of the rings you posted. Seriously, I need to shop NOW. I love snake rings -- animal rings definitely do seem to be making a comeback, I've always been a fan so I'm happy about it! 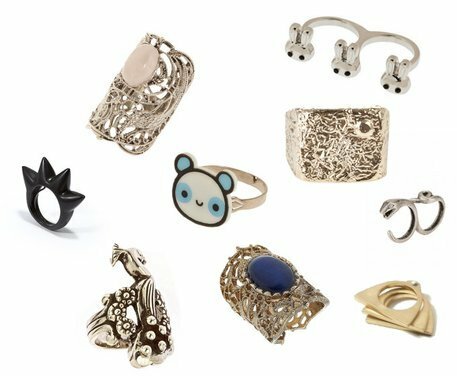 The panda and bunny rings are soooooo cute!!! i love the gold nuggest ring - very cute! Super cute things, I love you blog!! Following you!!! I've been obsessed with rings lately, as well! I can't seem to amass enough. And I agree with your favorites (and quite agree that being a student and on a budget is frustrating, as well)! Awee! Thank you for your lovely comment! I love rings, and the bigger the better! Great collection, raw stones are my favorite. I so love the colorful ring on the top left! PS I found you through Wasted Seventeen. i love the first ring in the left hand corner! Loving the rings! (: My favourite's the blue one too! Really awesome selections, they're beautiful. So pretty...I love all of the rings...the raw stone ones in particular! so flippin cute!! i love the cute rabbit ones! You know what, I've been on the hunt for some seriously nice rings recently (a fruitless hunt though!! )...my fave's that one with the stone at the bottom right...it's Topshop I think? i've seem a similar bunny version with that panda ring! i most especially love the blue raw stone...and that gold one which was done in a raw way as well. Wow these rings are absolutely gorgeous - I want them all! I love jewelry too! I just fell in love with the Monique Pean Natu Blue canvasite ring - it is just gorgeous! Hope I can find a similar (less pricey) one! My god these rings are amazing! I recently became obsessed with animal rings. They're everywhere! I want pretty much all the rings you posted. I'M OBSESSED BY THE RINGS!!! <3 YEAH, LOVE LOVE LOVE THEM! 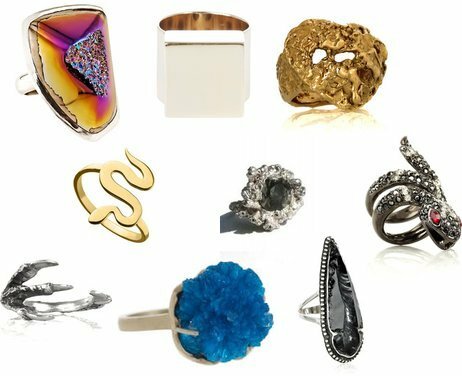 OMG, that Manu Spectrum Druzy Ring!!??? I FREAKING DIEEEE!! Love love LOVE it! I need it on my finger, stat! Thanks for stopping by my blog && leavin' the love! Hope to see you again! I have a serious lack of rings in my jewelry box. I think I'm headed to the flea market this weekend so I'll have to keep my eyes peeled! Oooo looove natural stone jewelry! Even thinking about it makes me bubble up with excitement! You've got a very cute blog here! So allow me to follow, and thanks for stopping by mine! oh! oh! oh! i want them all!!!! Plus I love the raw stones trend,if only I could afford something! thanks for following!!! i adore you! wow i love all of them... especially the rainbow looking one and the arrowhead one! You right, ive seen many girls wearing rings like yours and i think its another accesorie that should never be left behind. loveee the blue one in the first set! The rings you have chosen here are stunning! It makes me want to go out and buy some rings! Gorgeous rings! I've been eying snakes and stones, too. & haha, I often forget to wear jewelry, too. I hate that so much! Oh. My. God. I need, need, need these rings. They are so boss.